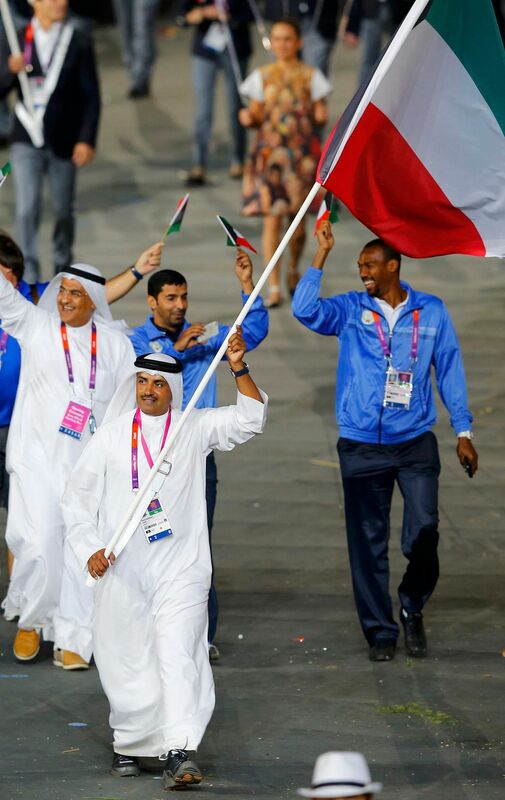 RIO DE JANEIRO • Kuwaiti shooter Fehaid Al-Deehani has refused to carry the neutral team flag at the Rio Olympics opening ceremony, where the Gulf state's athletes are barred from marching behind their own emblem. Kuwait is suspended by the International Olympic Committee (IOC) and other leading federations such as Fifa, football's world body, over government interference in sport. Despite last-minute calls for dialogue to get the Kuwait government to make a concession, Al-Deehani, winner of Kuwait's only Olympic medals, and seven other athletes are resigned to having to compete in Rio as so-called Independent Olympic Athletes. According to the Kuwaiti media, the IOC had asked Al-Deehani, who took trap shooting bronze medals at the 2000 Sydney and 2012 London Games, to carry the Olympic neutral team flag, but the army officer turned down the request. "I am a military man and I will carry only the Kuwait flag," the 49-year-old said. "I cannot carry the IOC flag." Both the IOC and Fifa have suspended Kuwait three times since 2007 over government interference. The latest dispute has caused anguish across the Gulf state, even pitting the government against global sporting powerbroker Sheikh Ahmad Al-Fahad Al-Sabah, a member of the IOC and Fifa, who is from Kuwait. The government has launched court action in Switzerland seeking US$1 billion (S$1.34 billion) in damages from the IOC over its suspension, which Youth and Information Minister Sheikh Salman Al-Humoud Al-Sabah has called "unjustifiable". The Court of Arbitration for Sport has already ruled against the government, and a UN envoy's efforts to mediate came to nothing. The Kuwait Olympic Committee on Sunday called on the government to start a dialogue in a last-gasp bid to get the Kuwait flag into the Rio opening ceremony. Hussein Al-Musallam, vice-chairman of the committee's legal and international relations commission, said it was time "to sit down together and review things in a positive way, the interests of Kuwaiti athletes should come above all else".